The Phoenix Coyotes and Los Angeles Kings made quick (no pun intended for the Kings) work of their Western Conference Semifinal foes and are in the midst of a long layoff before their Western Conference Finals matchup begins on Sunday night at 8pm EST (5pm Pacific). The Coyotes easily shut down a Nashville Predators team that went all-in for this year’s playoffs, knocking the 4th seed out in just five games. 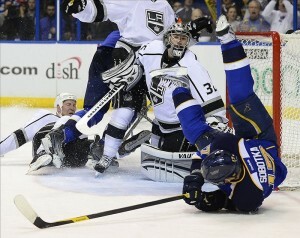 Meanwhile, the Kings were absolutely dominant in a four game sweep of the 2nd seeded St. Louis Blues. As we patiently wait for the Eastern Conference to determine their finalists (Game 7: Was @ NYR, 7:30pm on Sat), let’s take a look at how the regular season series played out between the Coyotes and Kings. Notes: Terry Murray coached LA in the two October meetings before current coach Darryl Sutter replaced him. Jeff Carter did not join LA until after the season series was over. Likewise, Antoine Vermette did not join the Coyotes until after the season series was over. Game 1: In the first game of the season series, the spotlight fell on the Kings’ Dustin Brown who scored a powerplay goal and Jonathan Quick who made 28 saves for a shutout. The Coyotes did themselves no favors by committing nine unforced turnovers as the Kings rode a strong second period to a 2-0 victory. Game 2: The Coyotes’ Radim Vrbata used the second game of the season series as a springboard into an unexpectedly strong and still underrated season. He scored 2 goals in the 2nd period and the teams went into overtime tied at 2. He then set up Daymond Langkow for the game-winning goal with less than a minute left in overtime to cap off his 3 point night. The Kings showed a lot of offensive promise, but couldn’t finish nearly enough as they went 0 for 4 on the powerplay and watched Mike Smith turn aside 37 of 39 shots. Game 3: A sellout crowd came out to watch the third meeting between the teams on the day after Christmas and saw a very sloppy game with below average goaltending. Jason LaBarbera started for the Coyotes and was pulled after allowing 4 goals. Meanwhile, Jonathan Quick did just a little better, allowing 3 goals on 29 shots to get the win. The teams combined for an astonishingly high 43 recorded giveaways. Raffi Torres had a 2 goal night for the Coyotes. Meanwhile, the Kings were led by unexpected scorers, getting goals from Rob Scuderi, Brad Richardson, and Willie Mitchell before Dustin Brown’s game-winner. Game 4: This game may have been the closest thing to a Western Conference Final preview as there could have been. Raffi Torres sat out with a suspension as both teams played impressively tight, defensive hockey. Goaltenders Quick and Smith were unbeatable in regulation, forcing the game to overtime tied at 0. Finally, Drew Doughty beat Smith less than a minute into overtime to give the Kings a 1-0 victory and preserve Jonathan Quick’s 2nd shutout bid of the Coyotes. fireworks throughout the game. The first period was highlighted by a fight between captains Dustin Brown and Shane Doan less than 5 minutes into the game, followed by additional fights between Mike Richards with Martin Hanzal, and Colin Fraser with Raffi Torres. Radim Vrbata scored the only goal of the game on a powerplay in the 2nd period before the teams resumed fighting with Paul Bissonnette and Kevin Westgarth dropping the gloves in the 3rd period. Mike Smith outdueled Jonathan Quick, making 28 saves for the shutout. Game 6: In the season series finale, the Kings skated out to a 3-0 lead in the 1st period that they would not be able to hold. The Coyotes stormed back in the 2nd period, and scored 3 powerplay goals by the end of regulation to tie the game at 4. Radim Vrbata put up another 3 point night as the teams went scoreless in overtime and proceeded to a shootout. Ray Whitney and Dustin Brown kept the teams even in the shootout before Mikkel Boedker scored the winning shootout goal on Quick. *Interesting note: Attendance in Phoenix for the last game of the season series was 10,842 (63.3% capacity). So, what does all of this tell us? Based on how the playoffs have played out so far, probably nothing that I can predict. However, it is likely a safe bet that Dustin Brown and Shane Doan will lead their teams emotionally, Anze Kopitar and Radim Vrbata will provide a few offensive fireworks, and Jonathan Quick and Mike Smith will frustrate shooters beyond their wildest dreams. Hockey fans around the world may not have paid attention to the six regular season matchups that I have mentioned here, but they will miss out on some truly great drama and hockey if they shun this series. The five 1-goal games (with the sixth being a 2-goal game) in this season series scream for postseason dramatics and emotional finishes. So get ready for a great Western Conference Final!